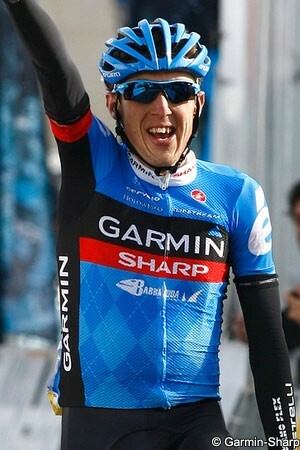 Dan Martin (Garmin-Sharp) took his long-awaited first major one-day victory as he escaped breakaway companion Joaquim Rodríguez (Katusha) in the final half kilometre of Liège-Bastogne-Liège. The Irishman - who joins compatriot Sean Kelly as a winner of La Doyenne - was able to follow the wheels of Rodríguez, as well as two-time winner Alejandro Valverde (Movistar), Michele Scarponi (Lampre-Merida) and Carlos Betancur (AG2R La Mondiale) as they made their way up to his Garmin-Sharp teammate Ryder Hesjedal on the final climb of the Côte de Saint-Nicolas, with just over five kilometres to go. When Rodríguez attacked just before the final kilometre banner Martin was the only one able to go with him, then was able to use his fresher legs to escape the Catalan rider as they rounded the final corner. Valverde outsprinted the others to take third. The victory was Martin’s second in the WorldTour this season, following his Volta a Catalunya triumph just weeks before. A coincidence involving Sean Kelly - who won the 1984 and 1989 editions of Liège, was not lost on the English-born Irishman. “Actually somebody texted me that the first year that Sean Kelly won Catalunya, he won Liège weeks later,” Martin said. “That was back in 1984. That was a bit of an omen and I’ve been thinking about it all week. The 261.5km race’s main breakaway came from Bart De Clercq (Lotto-Belisol), Vincent Jérôme (Europcar), Jonathan Fumeaux and Pirmin Lang (both IAM Cycling), Frederik Veuchelen (Vacansoleil-DCM) and Sander Armée (Topsport Vlaanderen-Mercator), who opened up a maximum lead of 14 minutes in the opening 50km of the race. Armée was the first to be dropped, as the break hit the succession of climbs in the final quarter of the race, but the rest were caught on the Côte de la Redoute with just under 40km to go. A break of seven riders broke clear on the climb, following an attack from David Lopez (Team Sky). With the Spanish rider were Jakob Fuglsang (Astana), Rui Costa (Movistar), Damiano Cunego (Lampre-Merida), Romain Bardet (AG2R La Mondiale), Alberto Losada (Katusha) and Mathias Frank (BMC Racing); the peloton was never far behind the group and, as Frank dropped back, he was replaced by Pierrick Fédrigo (FDJ) and Laurens Ten Dam (Blanco), but the move was quickly crushed by the BMC Racing Team. The red and black team tried to keep control onto the new climb of the Côte de Colonster - which had replaced the Côte de Roche aux Faucons - but a succession of attacks saw Ryder Hesjedal (Garmin-Sharp), Rigoberto Urán (Team Sky), Igor Antón (Euskaltel-Euskadi), Alberto Contador (Saxo-Tinkoff) and Giampaolo Caruso (Katusha) escape. Hesjedal promptly escaped alone and managed to build a lead of 20 seconds as he arrived at La Redoute, but this was eaten up quickly by the hard-chasing peloton. Betancur, Scarponi, Rodríguez, Valverde and Martin joined him before the top, and - mostly thanks to the hard work of Hesjedal - managed to keep the Astana-led chase at bay. “The idea was to get someone in front and that’s what Ryder did and I just stayed behind with the others,” Martin explained. “I couldn’t believe how easy it was in Saint-Nicolas. I was totally in control and followed any attack that went. Fearing the superior sprints of the others, Rodríguez attacked with just over a kilometre to go, but Martin managed to catch him inside the final 500 metres and attacked to victory shortly afterwards. After several breakaway attempts in the opening minutes of the race De Clercq was the first man to get away, after just four kilometres. The Belgian was quickly joined by Jérôme, Fumeaux, Lang, Veuchelen and Armée and, at the 30km point they were 8’10” clear. The six-man group covered 40km in the first hour, by which point they were 13’15” ahead of the peloton; the gap peaked at 14 minutes just three kilometres later as Katusha and Astana led the lethargic peloton behind them. Gradually the peloton began to close the group down, however; over the Côte de La Roche-en-Ardenne - the first of the race’s eleven climbs after 70km - it’s lead was down to around 11’30”. At the turn, at the “Rond-point La Doyenne” in Bastogne after 97km, the six leaders had a little over ten minutes of their lead left as they began the tougher, hillier journey back to Liège. Over the second climb - the Côte de Saint-Roch - with 145km to go the gap was down to 8’45”. The gap to the leaders continued to fall gradually on the rolling section of the course on the approach to the next climb, with several teams beginning to send riders forward. BMC Racing and Movistar were both at the front of the peloton in force - keeping Gilbert and Valverde respectively out of danger - and the pace began to pick up. Over the top of the Côte de Wanne with 101.5km to go, the break’s advantage was down to 5’42”, then onto the Côte de Stockeu Lang and Armée were dropped by the other four. At the summit with 95km to go the two riders were just five seconds behind the rest and they fought back up to them on the descent. Meanwhile, Movistar, BMC Racing and Vacansoleil-DCM were leading the peloton over the top of the climb 5’19” behind them, with the volume of riders forcing those at the back into a virtual standstill. On the Côte de la Haute-Levée the first aggression from the peloton came in the form of an acceleration from Blanco’s Tom-Jelter Slagter and, as he was joined by Ukrainian champion Andriy Grivko (Astana) and several others. BMC Racing closed the group down before the top of the climb, though, with 89km to go, and crested the top exactly five minutes behind the leaders. Over the Col du Rosier, with 76.5km to go, the gap was just four minutes, and over the Côte du Maquisard, with 64km left, it was down to 2’50”, as Armée found himself dropped again; this time there was no coming back for the Topsport Vlaanderen-Baloise rider. Shortly afterwards De Clercq suffered a puncture and, after visits to both the Mavic car and his team car, eventually took a new bike. Team Sky was now at the head of the peloton in numbers, and soon picked up the lone Armée; at the top of Mont-Theux, with 53.5km to go, the four leaders were several seconds ahead of De Clercq, while the peloton was at just 1’29”. De Clercq regained contact yet again as the leaders entered the final 50km of the race. The Team Sky-led peloton was in full cry by now, however, with most of the race’s big names manoeuvring themselves forward as they prepared themselves for the crucial climb of the Côte de la Redoute, which was now less than ten kilometres away. As the quintet hit the foot of the climb they had just 50 seconds of their lead left. The peloton turned onto the narrow climb and there was a small crash at one side, involving Andrey Amador (Movistar), but the peloton wasn’t slowing down. As the group up front began to split on the steep gradients Lopez jumped a little clear and made his way past the breakaway riders. Team Sky managed to block the head of the peloton for a few moments, but Fuglsang and Costa managed to get past and make their way up to Spanish rider. Jérôme was the last of the leaders to survive, but the three-man counterattack breezed past the Frenchman before he could get to the top. At the top of the climb with 38.5km to go the counterattacking trio was a few seconds ahead of the chase group of Cunego, Bardet, Losada and Frank; the two groups soon joined together and, after a brief period of looking to one another, began to try to open up a lead. Vacansoleil-DCM had missed the move and tried to send a number of riders across to join it, and the peloton’s increase of pace - as well as the lack of real cohesion in the lead - saw the group closed down quickly. Lopez had no intention of waiting, however, and attacked again; he was joined by Cunego and Bardet. The others were joined by Fédrigo and Ten Dam but, with Frank having dropped back to the peloton, the BMC Racing Team was now chasing hard. The eight riders were soon together again at the head of the race, but were still in sight as the red and black team pulled the peloton at speed behind them, and they were back in the fold before the 25km to go mark. BMC Racing continued at the head of the peloton, with Astana now moving up with Nibali in tow on the approach to the Côte de Colonster. As the climb began Costa accelerated again and pulled clear again, with several riders making their way across to him. Just over a kilometre to go to the top Contador attacked, but was joined by many of the others and Hesjedal then had a go himself. The Giro d’Italia champion had Costa, Urán, Antón, Contador and Caruso with him, and the group was 15 seconds clear over the top with 17km to go. Pierre Rolland (Europcar) tried to escape the chasers and bridge himself, but Gilbert chased across himself with another small group. This was closed down by the rest of the peloton shortly after the top of the climb, but Hesjedal had attacked from the lead group and was powering away. The Canadian was 11 seconds clear of his former companions with 15km to go, with Astana and BMC Racing leading the peloton at 21 seconds. The chase group was soon caught, however, but this meant that their teams were now free to join the chase, with Katusha putting men forward immediately. At the foot of the Côte de Saint-Nicolas Hesjedal was still 19 seconds clear, but Astana, Movistar and Katusha were all chasing hard. The seconds of the Garmin-Sharp rider’s lead began to tick down rapidly on the steep sloped of the climb, but his teammate Martin moved to the front to slow it down. Flèche Wallonne winner Dani Moreno (Katusha) crashed, which took some of the pace out of the chase, but Betancur promptly escaped and made his way across to the leader. The Colombian was joined by Scarponi, Rodríguez and Martin, and they joined up with Hesjedal before he reached the top with 5.5km to go. Valverde also managed to get across, but Gilbert was just unable to follow. Nibali had also missed the move and had his Astana team was working to chase it down. Garmin-Sharp had two in the lead group, however, and Hesjedal was still burying himself on the front for his teammate. With two kilometres to go the group was eight seconds clear, but Astana was edging closer on the drag up to the flamme rouge. Rodríguez attacked just before they reached the banner though, and escaped. Martin managed to chase down the Spanish rider before he reached the top of the long drag to the final corner, then attacked just as he reached it with 350 metres to go. The Irishman sat up and punched the air, raising both arms wide as he cruised across the line. Rodríguez rolled over in second place, while Valverde outsprinted the rest of the chasers to take third.